Recent calculations show that Lithuania has 500+ startups. The goal is to increase it to 1000 by 2020 - in less than a year. From our work experience a lot of startups struggle at certain points in their work and we are here to help! There are many people and opportunities they create in the Lithuanian startup ecosystem but are they visible? Perhaps we reached a point where it is so saturated that we began questioning quality? 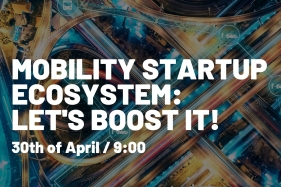 Join us for a discussion with Startup Lithuania, Katalista Ventures, Center for Physical Sciences and Technology (FTMC) as well as Mobility Innovation Center on what should be done for the ecosystem to strive and to help the current and the soon-to-appear startups! Karolis Stašys, FTMC Innovation Manager, will ask the question what is the recipe for a good startup ecosystem. We all know that we need premises and sources of funding but a lively startup also needs impetuous technology. One of the main recipe's ingredients - Center for Physical Sciences and Technology - is a place where science, technology and business come together and where innovations are born. The Center has years of experience in intellectual knowledge commercialization and is determined to share this experience and opportunities with the ecosystem. 10:00-10:30 – Mobility Innovation Center: Mobility is our drive so how do we boost it? 10:30-11:15 – discussion with the audience: what is necessary for the current startup ecosystem in Lithuania that it would strive further? Is there something missing or do we have too much to handle? Get your free ticket at eventbrite. See you soon!